As it appears that Michigan's 9 month long winter has finally died, it's time to get the projects rolling again. Here is a brief overview of where everything stands in my garage, in order of priority. After throwing a rod in protest of it's new headgasket, the E30 was drug out to the shop and disassembled for a post-mortem. Absolutely nothing within a 12" radius of the connecting rods was remotely salvagable so a new long block was obtained from American and Import Auto Parts in Detroit. Due to the motor being from an E36, several modifications were needed to make it E30 ready. These are now complete and the motor is ready to be reinstalled now that all of the shrapnel has been cleared from the engine bay. The old components have moved to the scrap heap outside the shop door which the E30 has narrowly avoided...this time. The yellow Simca is back out of the garage and being driven. But now I'm starting to remember why I put it away early last fall, vowing not to drive it until some major issues (e.g. sticking clutch, grinding front brakes, no rear brakes, rooster tail of road debris that shoots through the cockpit) were repaired. The blue Simca has not been touched other than being unloaded from the trailer and placed next to the barn. It's still unclear whether this will be the parts car or body donor, or whether both cars could be made roadworthy (with the help of an Omni GLH motor?). The latter is an appealing but ultimately terrible plan. The blue car needs at least the same frame repairs that the yellow car needed but lacks a running motor. The rest of the body is much, much better than the yellow car. Who knows? I'm suspecting that this decision will not be made until the yellow car gives up, leaving it in the same condition as the blue car. 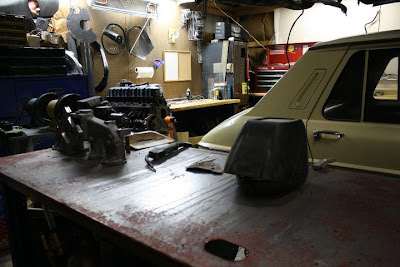 Progress on the Javelin has been shockingly slow, with the last work on the project being front suspension dropped and sand blasted during the fall. Preparations are being made to the engine compartment to get ready for paint. The engine, a high comp 4.0 Jeep with solid lifter cam and roller rockers, is nearing completion but lacks pushrods. The lift on the cam is somewhat scary when viewing the rocker motion with the valve cover off. Futher adjustments to rocker placement are needed to avoid shooting boomerang shaped pushrods out of the hood at a 45 degree angle. T5 transmission and Explorer rear end work is yet to be started. The only progress made in the last 6 months pertains to procurement of engine controls and wiring. The F-250 has been upgraded from critical to stable condition after it's rash of fuel system issues over the winter. It is now to the point of barely fulfilling it's daily obligations. Left on the to-do list are the tank switch, driver's seat, and tie rods. The front left fender is starting to show rust through. A quick taste of whatever was oozing out of the rust bubbles yielded notes of road salt and brake fluid - I'll have a look. This truck may be for sale or trade in the near future. I'm thinking XJ, Diesel Trooper, Disco, or El Camino would be sufficient and would free up some extra coin. In response to the recent Volodrome activity being attempted by Chris and Dave in their Honda Sprees, I'll be dragging out Grandpa's old Chappy for dual errand and race duty. A drag race with the Sprees may be in order for benchmarking. I'm expecting a solid and respectable third place finish. As the weather warms and the garage gets more bearable, I'm hoping to use my summer for some good projects and posts. Is there any interest in starting a section for garage pictures? Im trying to figure out a good way to arrange stuff (and show off haha). It would be awesome to have a garage section for all users. Not quite there yet, sorry.